Late night Moscow, Russia is vibrant and there is always something to do even if it already passes midnight. The capital city of Russia never sleeps and serves 24 hours a day restaurants. Therefore, it is possible to eat out after midnight among the famous restaurant in Moscow where it is easy to find a halal restaurant, low budget meals restaurant, and even the late night restaurants. Late night menu in Moscow offers Italian pasta, Russian borsch to Chinese noodles. Therefore, you can pretty much find any kind of meal after midnight in Moscow. Your late night snack doesn’t have to be a fast-food joint. So whether it’s a post-party hunger, a late night dinner, or an early breakfast, you’re in the right place. Here are some of the famous late night restaurants across the capital of Russia that serve around the clock. Moscow nightlife is complete after spending a luxurious dinner in this fancy restaurant. Therefore, the center of Moscow’s restaurant for people who can afford the best Russian aristocratic cuisine. Moreover, its premium location in a Baroque mansion on Tverskoi Boulevard, the restaurant attracts both Russian and curious foreign tourists. The interior depicts classic Russian antiques. In addition, Pushkin is a “must see” for everyone, just like the Bolshoi Theater and the Kremlin. It serves the finest high-class dishes such as Black Caviar, imperial ukha (chowder) with ginger vodka and homemade preserves made from spruce cones. The cafe performs famous poems from Alexander Pushkin even late at night. A brand new Moscow’s finest cocktail establishment that open all night long. It serves a vast choice of breakfast little menu for those who are not ready to go to bed after the party. Moreover, they have some of the best cocktails serving in the city. Mixology of cocktails uses only the best and natural ingredients and liquors. The service is ridiculously attentive and always try to make you feel like you’re at your home away from home. You can’t miss this place among the uptown neighborhood bar. You just need to take a short walk from the famous landmarks in Red Square. 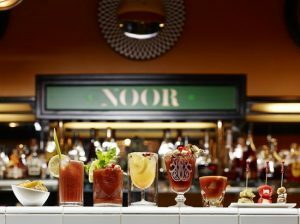 Noor bar is a modern typical next-door bar with a touch of Russia’s ethereal chic. You will experience extravagant meat dishes and nothing less. Moreover, This meat restaurant opens around the clock and home of the best meat lovers in the city. Andrei Zavarnitsin the head chef is famous for his masterpiece dishes. The all grill menu has sections called Grill 100%, Instead of the Grill, Before the Grill, and After the Grill. Moreover, Their famous and popular cuisine all serve over the fire. It includes the Caesar Salad in black sauce with grilled turkey, the octopus with garlic sauce, burgers, and even the dessert. This new Moscow-based restaurant chain has been around the country since 2001. It has gained popularity among Russian and tourist. Many countries serve coffee shops and cafes as a place to hang out, Moscow is no exception. In addition, This place has become a part of daily life for thousands of its guests. It combines a warm and cozy coffee house and restaurant perfectly. Moreover, it offers an extensive menu collected from all over the world. Therefore, it’s the right place for a dining experience and excellent service. Come here anytime, it opens 24 hours a day. A classic American diner has come to Moscow. It brings old American diner vibes to Russia. It offers classy waiters on roller skates, jukeboxes, Elvis portraits, a pink Cadillac inside the premises and huge portions and juicy burgers. This place serves light meals although surely better than at KFC or McDonald’s fast food chains. Moreover, the atmosphere is also quite invigorating and lively. Late night dine accompanied by music from the music box with old songs and dancing beats. There are also chocolate brownies, snacks and delicious milkshakes served in tall glasses. The restaurant serves up Italian delicacies around the clock until the early morning. Here you can treat yourself to some of the late night dishes with the best pasta, pizza, and tiramisu even if it is way past your bedtime. However, the restaurant also serves beef steaks and lasagna for a heavier menu. Fine Russian dining is the theme of this place. It’s an emphasis on Soviet recipes inspired from Caucasus and Ukrainian cuisine. It serves hot, juicy piece of meat and for the light and refined appetizers. Bochka restaurant is a two-storied chalet-type building. It has wooden beams and a brazier in the middle of the room on where young steers are cooked on a spit over birch coals. Guests are unlikely to be able to try the steers, but head chef Igor Bednyakov cooks everything else 24 hours. The menu has 15 grilled meat dishes, an imperial chicken cutlet with baked pumpkin and apple-mustard sauce. Their popular dessert is homemade éclairs and a very delicate classical Napoleon cake. Homey places ope 24 hours with the highlight of breakfast menu. The main courses are the egg plates cooked in different ways. The food looks incredible on the plate and taste. It also serves a great range of coffee. There is nothing wrong about breakfast at night if you are in Moscow. The restaurant’s specialty is round-the-clock breakfasts dishes from all over the world. There are more than 27 of them on the menu, from ordinary fried eggs sunny side up to more unusual dishes. Chef Alexei Beryozin serves the popular classical recipes in an original manner. You can’t go wrong with Eggs Benedict the egg is not served on a muffin, but on a rösti with spinach and hollandaise sauce. Moreover, it has wire variation of egg dishes. It also serves, Kyukyu (an Azeri omelet with cheese and spinach and mozzarella, before serving it with sheep cheese. Moscow offers the most luxurious shopping place in Russia where you can do some shopping there. Moscow’s elite socialite dives in the glitz and glamour at an upscale nightclub called SOHO Rooms. It offers one-stop entertainment in an embankment outside the city centre. Moreover, the place is a good getaway place to escape from the bustling city. It features a multi-floor space with a restaurant, bar, and disco room, with the best cutting edge sound and light systems. Although the dress code is casual, most of the guests dress formally. You can dine and have fun in this place. Moscow is more alive at night than during the day. You can experience Moscow street style at night from enjoying Gorky Park at night, browse Moscow metro stations, hang out at late night restaurant, bars and cafes. The city offers the greatest landmarks that are illuminated with a spectrum of colors under the starts. Moscow can make your night unforgettable. it is the best way to experience Moscow like a true Russian.